Do you love pre-Deadpool Ryan Reynolds? Well now that you've surely bought Deadpool 2 on 4K, it's time to upgrade your copy of Van Wilder. Lionsgate has finally gone back to the well and has given this film a proper A/V upgrade complete with Dolby Vision HDR and a new Atmos audio track. The A/V presentation may not be the best of the best, but it is a huge improvement for this film. No new bonus features have been produced for this release and the included Blu-ray is the exact same one as before. This new Van Wilder is still For The Fans, but more specifically for those who are 4K ready. Now that I have watched this movie twice in a year, far more than I ever intended to revisit this film in a lifetime, I'll still hold that I am not a Van Wilder fan, but I did laugh. With this new 4k Ultra HD Blu-ray release, I invite you to take a look at my previous review for the reissue Blu-ray that dropped earlier this year. As this film was never exactly my bread and butter, I don't really have a whole lot to add to the discussion of Van Wilder beyond what we already had to say about in 2007. Ryan Reynolds big debut to the world of comedy is still that same crass and often pointlessly disgusting film you remember from 16 years ago. The only thing that's changed is Reynolds has refined his brand of humor into a few modest successes, a misguided turn as a CGI-enhanced Green Lantern, and has since become an international superstar largely thanks to the phenomenal success of Deadpool. With Deadpool 2 out this year, I guess Lionsgate thought it was the right time to revisit Reynolds college comedy. In full honesty, I was never a fan of Van Wilder - even though I was prime for the target demographic when this flick hit theaters. I was 20, in college, male, and had an appreciation for gross-out humor. Thinking I'd be getting something along the lines of what American Pie or Scary Movie had to offer, at the time I figured this film would be a winner. Instead, Van Wilder marked the day I lost interest in that sort of movie. Back then I used to triple feature movies at my local theater when I didn't have classes. I'd schedule things out, find the times that lined up and then just blow my day at the movies while eating copious amounts of popcorn. Good or bad, it didn't matter what the movie was, I saw everything. Thankfully I scheduled this one first so I had something to look forward to. It was a rough 94 minutes. Today, I don't hate the movie like I did back then. I don't actively avoid it or restrain my contempt for people who enjoy it. I'm simply indifferent to it now. I'll admit that some of the gags made me chuckle; I'd actually forgotten the pantsless negotiation with the jumper at the beginning. A few other tidbits here and there put a smile on my face, but for the most part, it was just another noisy movie where the jokes flew fast and furious but few stuck the landing. The amount of body fluid from both human and animal didn't really make me feel one way or the other. Perhaps because this sort of thing is now commonplace for this sort of comedy? I mean really, after The Hangover Trilogy, what haven't we seen in a comedy? At the end of this latest viewing of Van Wilder, I was given a sense of appreciation that Ryan Reynolds has come a long way. While he tries his hand at drama every now and again with movies like Woman in Gold, his quick-witted foul-mouthed sense of humor seems to have found its place. Deadpool proves to be the perfect foil for the Canadian actor to play with and make those jokes stick. I guess the best way to view Van Wilder is as a sort of time capsule. It's that weird time when no one knew who Ryan Reynolds was but everyone knew Tara Reid. If you loved Van Wilder when it first came out, you'll probably still get a laugh from it. If it was never your cup of tea to begin with, you probably don't need to give it a revisit. Deadpool 2 is now available and probably a better way to spend your time. 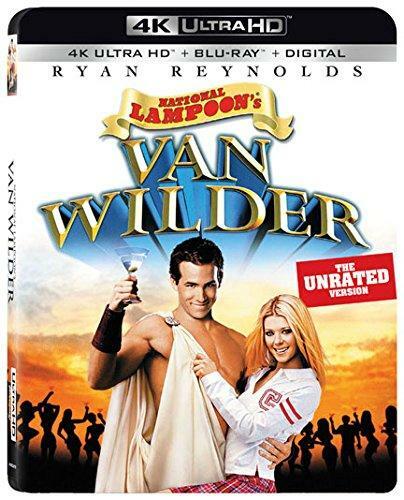 Lionsgate graduates Van Wilder to 4K Ultra HD in a two-disc 4K UHD + Blu-ray + Digital HD set. 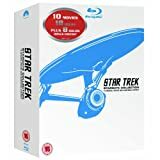 Pressed onto a Region A BD-100 disc, the discs are housed in a standard sturdy black two-disc UHD case with identical slipcover artwork. The included Blu-ray is the exact same one as the previous reissue release and does not come with any new bonus features or content. Well, I guess a good rule of thumb is never count out a re-release of a movie. Considering the standing of this film with its small but dedicated fanbase, I honestly didn't expect much for Van Wilder on 4K Ultra HD Blu-ray. I figured it would enjoy a modest uptick in clarity and colors but that was about it. Lionsgate has managed to deliver a solid HVEC encoded 2160p 1.85:1 transfer with Dolby Vision HDR for this film. It's not perfect mind you, there are still some issues to report keeping it from being a demo disc for your setup, but overall this is an impressive improvement that runs in stark contrast to the dated and sad Blu-ray that was included. In the plus column, clarity has been greatly improved. As the film was finished on a 35mm negative, it isn't restricted to a 2K DI allowing for a wider range of fine details with a stable film grain presence. Grain can be a bit thick at times, some of the evening frat party sequences can be a bit more prominent but I wouldn't call it overly distracting or problematic. In addition to facial features fabric texturing is much more apparent as you can now make out little stitch patterns in clothing and furniture. On this front alone, this is a worthy reason to upgrade. With Dolby Vision, employed colors are richly saturated with terrific primaries. Reds are especially vibrant while blues and yellows bring plenty of pop to the equation. I did feel that flesh tones could get a little too hot at times giving some actors a bit of a pinkish hue but that was intermittent and not too severe a swing from natural. As for black levels and contrast, here is where things get a bit iffy. Black levels aren't necessarily bad, but the image is noticeably darker than the previous Blu-ray and DVD - however, that's not a bad thing, just gives the image a bit more of a natural gradience. Where things get dicy is how blacks never quite reach that desired deep inky color we hope for. If anything, they stick around a middling brown tone during dark night scenes. Contrast also posed some blooms at times but nothing too serious. I did spot a bit of banding towards the beginning of the film, but it never showed up again. Overall this is a night and day improvement over the previous Blu-ray so fans who have been holding out for a better presentation can safely upgrade to the 4K. On top of getting a decent Dolby Vision HDR transfer, Van Wilder raided Dolby Atmos for a new and vastly improved audio mix. I always thought that LPCM 7.1 mix was a rather hollow and lifeless mix so this new Atmos track punches things up nicely. Dialogue gets a little more lively resonance. Scoring, on the whole, is stronger with a better presence without intruding on the elements. Sound effects get a nice uptick as well giving some of the more squishy bits some extra heft and a little more LFE presence making them all the more stomach churning. Levels are spot on without any need to ride the volume button. However, like the video transfer, it's not quite perfect. In truth, I'm kinda surprised this film was given an Atmos mix as most of the time there just isn't any call for it. For long stretches of the film, the audio feels very front and center with only a few instances of side surround activity with little to no vertical presence. Granted, the extra element spacing is helpful and lets the audio breathe a little, but it's hardly necessary. This is a great mix as far as Van Wilder standards go, but I wouldn't put it toe to toe against other Atmos tracks. While nothing new was created for this release, I do have to hand it to Lionsgate for porting over most of the bonus features onto the actual 4K disc itself rather than simply relying on the included Blu-ray to track that load. Like I said there's nothing new, but if you're a fan the best stuff is here. The few features that didn't make it are on the included Blu-ray.